Hatters striker James Collins was more than happy to be put on the spot during last weekend's 1-1 draw against Sunderland. The Luton forward was called into action once Danny Hylton was fouled inside the area with 22 minutes to go, slamming home his fourth spotkick of the campaign, the first time he has taken one when Hylton himself had started too. Collins said: "When Danny was out, I was taking them, and I think because I’ve scored the last couple, it’s not really changed much. "The three of us who can take them, me, Danny and Elliot (Lee), it’s just whoever gets nominated on the weekend and that’s how it is, but no-one’s designated penalty taker. “I practiced yesterday, I always practice on a Friday and it didn’t go as well as I hoped. "But I knew where I was going, I was never going to change my mind and it was an honour to score a stadium like this in front of so many fans, even if I was getting whistled and booed. "But that’s part and parcel and I’m delighted for everyone to do with Luton that it went in. “Bit gutted it wasn’t in front of them, but to score at a stadium like this, it doesn’t happen every day, so I’m delighted." Interim boss Mick Harford said of the strike: "Collo is the nominated penalty taker and he smashed it down the middle. "It was a deserved penalty and a deserved goal I thought." The opportunity came about after Collins' 25 yarder had hit the post, with Hylton picking up the rebound only to be fouled. However, Hylton then saw red moments later for an aerial challenge with Jack Baldwin, which Collins felt dented their victory chances. He continued: "I thought the first shot was in, it hit the post and then Danny’s reacted well. "He’s done well to manoeuvre the ball in the box and the lad's brought him down and I thought the chance had gone, but then the referee’s called for the penalty, so I was delighted I managed to put it away. "After our goal, we carried on playing some nice stuff and they couldn’t get out of their half. "Who knows what would have happened if it was 11 v 11? But that’s why we’re a team/. "Someone gets sent off or someone gets injured, we back each other and we grind it out and that’s what we did for Danny today." Collins could have been on the scoresheet even earlier, as after Chris Maguire put Sunderland ahead on 16 minutes, he was denied an instant leveller by a superb point blank save from home keeper Jon McLaughlin. He said: "I didn’t get great contact on it, but I got enough to think it was going in, but he’s just come out of nowhere and tipped it round the post. "His save from Andrew Shinnie as well, which I was right behind, it was a great save, so credit to him and he plays for Sunderland for a reason. "I thought we were the better side to start, I thought we were brilliant, created chances, put them on the back foot, they couldn’t get a foothold in the game. "Then if you miss those chances, you give side's a bit of hope and they went and scored a goal and we were disappointed with that." 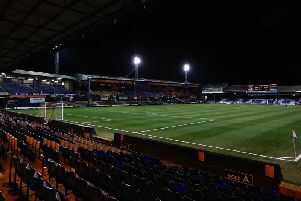 The striker's leveller meant Luton preserved their long unbeaten run in the league and Collins knew they couldn't leave Wearside too unhappy with that outcome. He added: "I think you’ve got to respect a point at a place like this. "They’re a good side and they’re in the position they are because they’re a good side. "I think first half we had some great chances, the keeper’s made two unbelievable saves, so going on chances, I’d probably say we are disappointed at not getting the three points. "But I think with the circumstances in the game, the two lads getting sent off when they did, I think you’ve got to respect a point. "Me personally, I think anyone who finishes above them this year will get promoted."